Eden Anti Flea and Tick Spray contains non-toxic ingredients and is based on natural products. It is suitable for dogs and cats. 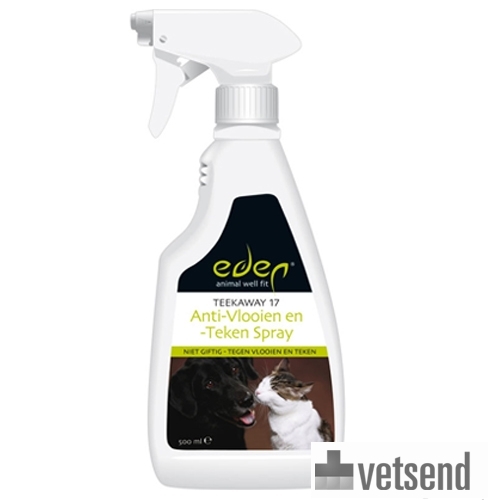 Eden Anti Flea and Tick Spray protects against fleas and ticks in cats and dogs and is easy to use. The spray contains organic, natural or nature identical ingredients and does not irritate your pet's skin. In addition, the spray is soluble in water and biodegradable. Spray a fine layer of the Eden Anti Flea and Tick Spray on your pet's fur, but do not spray on the head. Eden Anti Flea and Tick Spray is effective for up to 24 hours, depending on activities and the weather. If necessary, repeat the application. For specific applications or specific situations, consult your veterinarian. All products by Eden are non-toxic and based on natural products. They also have no negative side effects and are easy to use. It is possible for ticks to break through the protective barrier created by the collar, particularly in areas with a high tick population. Unfortunately, there are no flea or tick products that are 100% efficient so it is very important that you check your dog for ticks on a daily basis and remove them properly should you find any. Have you used Eden Anti Flea and Tick Spray before? Let us know what you think about this product.